This morning, Friday March 9, we docked in Philipsburg, the capital of Sint Maarten. Saint Martin is a small island that is divided into two jurisdictions. The northern part (a little over half) is French while the southern part is Dutch. Since October of 2010 Sint Maarten (the Dutch side, where we are docked) has been a “country within the Kingdom of the Netherlands,” which generally means they have control over most internal affairs while the Netherlands is responsible for defense and foreign relations. Philipsburg is a beautiful spot with great beaches, a nice harbor & lots of duty free shopping. As a result, it attracts cruise ships in great numbers: there were only two today, but there are often 5 or 6 ships each day. This is our third time in Philipsburg. Philipsburg is crowded with stores selling everything from diamonds and watches to cheap keepsakes. 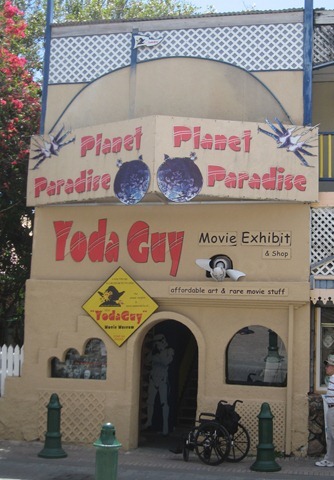 Two of the more unusual stores are “The Yoda Guy,” operated by a fellow involved in the animation of Yoda in the Star Wars movies, and the Guavaberry Emporium. Guavaberry is a local product that we are led to believe grows only on this island and they make it into a liqueur. The Guavaberry Emporium was once the Philipsburg synagogue. The statue of the old man in the top hat represents their logo. We also found the Philipsburg Jubilee Library, a nice open building full of students whose bookmobiles had a Caribbean flair. Philipsburg has a beautiful wide white sand beach along the town’s entire length, with clear blue-green water. There are restaurants all along the edge of the beach & they rent out chairs & umbrellas (sometimes with a couple of beers included in the price). There are also vendors walking along the beach, who will offer their wares (usually hats or shirts) while you sit in the outside cafe drinking your beer & eating your lunch. 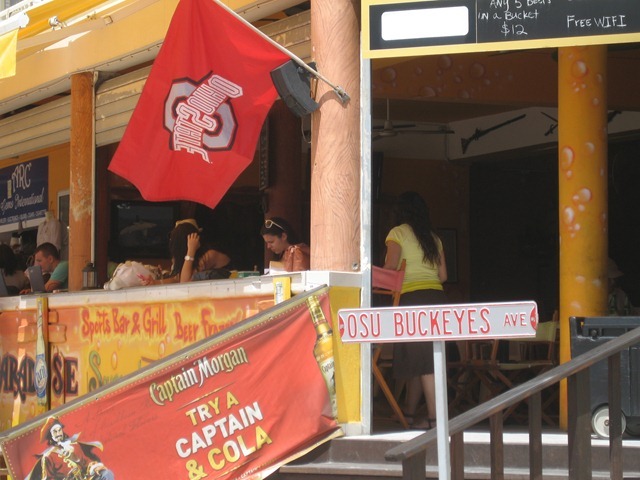 We even found a restaurant on the beach apparently run by Ohio State expatriates. This part of town really fulfills the stereotype of an idyllic Caribbean paradise. St. Martin was a pirate haven in the 16th century & there is a lot of pirate stuff around (particularly tee shirts), including the guy below who sits in front of one tourist shop. 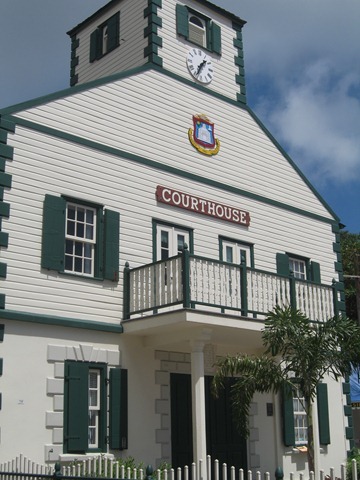 Philipsburg’s courthouse was originally built in 1793 but has been restored several times & used for other governmental units since, before being restored to courthouse status. Lucy’s guesthouse is mostly of family interest, and we were taken with the Pelican engaged in its toilette on a local boat. In the last couple of years Philipsburg has built a very nice new dock facility (with, of course, a large shopping area). It is only about a 15 minute walk into town and there is a very nice curving stone bridge at the end of the walk where these pictures were taken. Thus ends our final stop on this lengthy voyage and it was an enjoyable port and a beautiful day. As you can see, we have put on a little weight (it’s a cruise, after all) but we can still fit into all of our clothes. And to top it off we had a glorious sunset over the Caribbean (to me, the second one looks like a western painting, perhaps northern Arizona, but in fact its only clouds). On Thursday, March 8, we pulled into Castries, the main city on the island of St. Lucia. St. Lucia once had a history of rapid changes of European owners but today it is a member of the British Commonwealth. So of course they drive on the wrong side of the street (dangerous for Americans used to looking left before crossing the street). We don’t know how many people live here but it is a pretty small town. There were three other cruise ships in this small harbor and they were big ones, so the population here today was probably only about 75% local citizens. After breakfast we walked into town, a pleasant stroll around the bay that took about half an hour. Among other things there was a fellow selling these bird bowl carvings (many of which we saw later all around Castries), which were hanging from a tree. We visited the local market, which mostly sold clothes, and came upon an unusual statue. The best things we saw were around Derek Walcott Square. Derek Walcott is a poet born on St. Lucia (though he has lived mostly on Trinidad) who won the Nobel Prize for Literature in 1992. Actually St. Lucia has had two Nobel Laureates; Sir William Arthur Lewis won for Economics in 1979. That’s quite a lot for such a small island & they are quite proud of that; busts of both Nobel Laureates are displayed in the center of Derek Walcott Square. In the park was a painted fountain & a huge tree said to be 400 years old. Most of the gates to the park are topped by cherubim, who have green grass strategically painted over their private parts. On one side of the square is the cathedral. It looks like drab grey stone on the outside but the inside is full of color and rich in character. It was prefabricated in France and shipped here & assembled in the 1890’s; the interior ceiling buttresses & the background construction on the stage are made of cast iron, in the fashion (and perhaps by) Gustave Eiffel. Altogether one of the more delightful churches we have seen, though far from the most elaborate. On the other side of the square is the nicest looking building in the city (from the outside), the Carnegie Central Library. We were surprised to find a Carnegie library this far from the United States. And in the children’s room was the ubiquitous cartoon character that some of you know & love. And on a third side of the square was a block of nice older wood and lattice buildings, one of which is the Ministry of Justice. That’s pretty much all there was of interest. I don’t have a picture, but on our walk we came across a group of kids about 10 years old playing cricket with plastic bats, ball & wickets in a small school yard. Great enthusiasm but very little skill. Cricket is pretty much a mystery to us but we’re pretty sure you aren’t supposed to pitch the ball two feet behind the batter and you aren’t supposed to throw your bat 10 feet when you swing. The rest of the island is quite lush rainforest, with a volcanic mountain in the interior and lots of nice beaches, but we didn’t see any of that (except from the ship as we pulled out). We ended the day with a nice but muted sunset.